The object of this book has been to produce a collection of original pieces which are both reasonably easy and enjoyable to play. I hope I’ve succeeded. I certainly enjoy playing all of them. 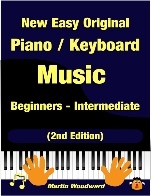 The 16 original compositions in this collection range from moderately easy to intermediate, but certainly not difficult. Although I have indicated this in the overview they are not featured in any particular order of how difficult they are. In relation to the Associated Board grades, I would rate these pieces at between grades 1 to 5. All except one have been written with a ‘chord line’ so that they can alternatively be played easily using an electronic keyboard with auto accompaniment. Additionally, many of the pieces can be played on a four or five octave keyboard.